Bableves Füstölt Kolbásszal | Bean Soup with Sausage is a Hungarian food recipe with vegetables in a creamy broth. In a colander, rinse beans well under cold water and let drain. Place beans in a medium saucepan, with enough water to cover. Bring beans to a boil and boil 2 minutes. Remove pan from heat, cover, and let stand 1 hour to soak beans. Peel and chop onion. Peel carrots and parsnips and cut into thin 3-inch-long slices. In a kettle, heat oil over medium heat for 1 minute. Add onion and sauté until transparent. Add beans, paprika, bay leaves, salt, carrot, and parsnip to kettle, sprinkle with flour and stir well. Add water and stir. Cover and simmer over low heat for 30 to 45 minutes. Add sausage. Cook 55 to 60 minutes more until beans are tender. Just before serving, add vinegar and stir. 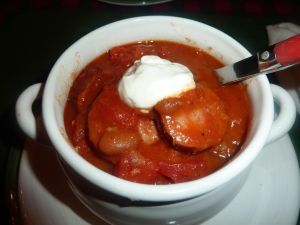 Place 1 c. of hot soup in a small bowl, add sour cream, and stir until smooth. Add sour cream mixture to kettle and stir well. Serve hot.